For those unlucky souls who didn't get a chance to see Iggy & The Stooges reunited - and with Mike Watt now in the line-up - like myself, you probably felt a wave of disappointment and sorrow. I know I did. Though, I kept thinking, if I had one chance to see any of the Stooges reunion shows, I would have chosen the Detroit show. You knew it would be off-the-hook and the show NOT to miss. 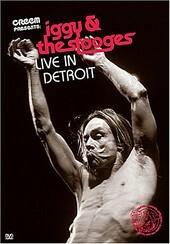 Well, lucky for us the show was filmed and, along with Music Video Distributors, The Stooges are releasing it on DVD. This is probably the only time I'll say this, but forget the bonus material. Forget the footage of the band's legendary NY in-store gig, or the photo gallery, or Mike Watt's journal readings, or CREEM's archives (which is quite nice, don't get me wrong). Forget all of it. I want to see Iggy and the Stooges rock out and hear those timeless songs roar from my speakers as my eyes fixate on the band blasting them out on stage. BUT! WAIT! Do I? I mean, what happens if I watch and the show is a disappointment? A bunch of old men who shouldn't be playing rock 'n' roll re-hashing the glory of the songs they wrote in the 60s, the ones that transcended rock 'n' roll? Let's be honest here, Iggy's most recent output hasn't been the best. However, since I was so anxious to see the Detroit show, I proceeded, but with caution. I was pleasantly surprised though. Here is a band that is still in fine shape, playing in fine form, delivering the songs with as much stamina and power - if not more - than those treasured recordings. Yes, the reunion was a success and thanks to the magic of DVD, can be re-lived over and over again. Especially for those, like myself, who weren't there but want to feel as if we were, and want the experience of being there. This DVD does the trick. Ah, thank you, thank you. I'll give it an A+.